Safety Score: 3,3 of 5.0 based on data from 9 authorites. Meaning please reconsider your need to travel to Palestinian Territory. 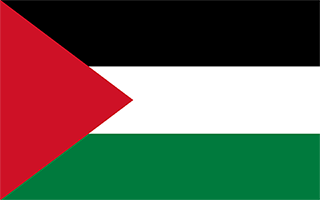 Palestinian Territory with its capital is located in Asia (Middle East, west of Jordan). It covers some 5,861 square kilometers (slightly smaller than Delaware) with 2,747,940 citizens. Arabic is the official language used in Palestinian Territory. Egypt, Israel and Jordan are bordering countries. Palestinian Territory consist of two physically separate entities, the West Bank and the Gaza Strip and are not considered part of any sovereign nation. Trek along the path that took Joseph and Mary from Nazareth to Bethlehem. Walk along the settings that the Patriarch Abraham wandered through during his journey across the Levant region. The Abraham trail is a joint project with branches in Turkey, Jordan, Israel and Palestine. The topography is mostly rugged, dissected upland in west, flat plains descending to Jordan River Valley to the east. The average density of population is about 469 per km². The climate in Palestinian Territory can be described as temperate with temperature and precipitation vary with altitude, warm to hot summers, cool to mild winters. Potential natural disasters are droughts. To reach someone Palestinian Territory dial +970 prior to a number. The local cellular networks are operated on . Websites typically end with the top level domain ".ps". If you want to bring electric appliances (e.g. battery chaarger), keep in min the local . The sign for the locally used currency Shekel is ILS. From the early 16th century through 1917, the area now known as the West Bank fell under Ottoman rule. Following World War I, the Allied powers (France, UK, Russia) allocated the area to the British Mandate of Palestine. After World War II, the UN passed a resolution to establish two states within the Mandate, and designated a territory including what is now known as the West Bank as part of the proposed Arab state. During the 1948 Arab-Israeli War, the area was captured by Transjordan (later renamed Jordan). Jordan annexed the West Bank in 1950. In June 1967, Israel captured the West Bank and East Jerusalem during the 1967 Six-Day War. With the exception of East Jerusalem, roughly 60% of the West Bank remains under Israeli military control. Israel transferred security and civilian responsibility for a number of Palestinian-populated areas of the West Bank and Gaza Strip to the Palestinian Authority (PA) under a series of agreements signed between 1993 and 1999, the so-called “Oslo Accords.” Negotiations to determine the permanent status of the West Bank and Gaza Strip stalled after the outbreak of an intifada in mid-2000. In early 2003, the "Quartet" of the US, EU, UN, and Russia, presented a roadmap to a final peace settlement by 2005, calling for two states - Israel and a democratic Palestine. Following Palestinian leader Yassir ARAFAT's death in late 2004 and the subsequent election of Mahmud ABBAS (head of the Fatah political faction) as PA president, Israel and the Palestinians agreed to move the peace process forward. Israel in late 2005 unilaterally withdrew all of its settlers and soldiers, dismantled its military facilities in the Gaza Strip, and redeployed its military from several West Bank settlements, but it continues to control maritime, airspace, and other access. In early 2006, the Islamic Resistance Movement, HAMAS, won the Palestinian Legislative Council election and took control of the PA government. Attempts to form a unity government failed, and violent clashes between Fatah and HAMAS supporters ensued, culminating in HAMAS's violent seizure of all military and governmental institutions in the Gaza Strip. Fatah and HAMAS have made several attempts at reconciliation, but the factions have been unable to implement details on governance and security. In an attempt to reenergize peace talks between the Israelis and Palestinians, France in June 2016 hosted a ministerial meeting that included participants from 29 countries, although not Israel or the Palestinians, to lay the groundwork for an envisioned "multilateral peace conference" later in the year.